Lieutenant Dal Pra gives Governor Pritzker a briefing on the flooding situation in Machesney Park last Wednesday. Gov. 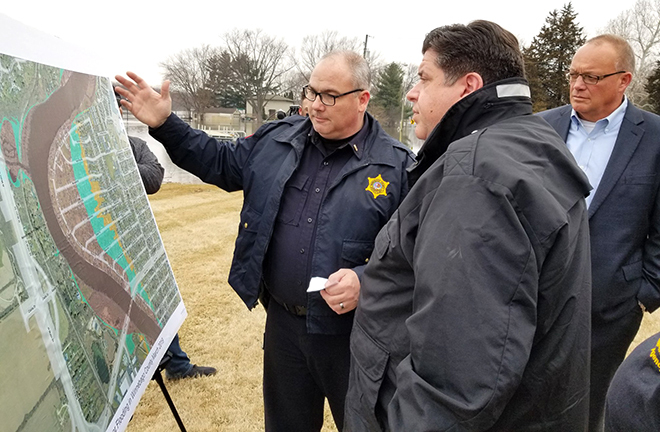 JB Pritzker, Acting IEMA Director Gen. Alicia Tate-Nadeau (ret) and several local elected officials and law enforcement representatives toured flooded areas of Winnebago and Stephenson counties, underscoring the state’s commitment to help communities rebuild. “These are some of the highest river levels this area has seen in more than three decades, and I commend local emergency managers, law enforcement, fire and the volunteer organizations that have come together to keep people safe and preserve property,” said Gov. JB Pritzker. The State of Illinois continues to monitor fluctuating river levels up and down our state. These communities are no strangers to season flooding. Emergency crews in Winnebago and Stephenson County have been preparing for and fighting back floodwaters for several weeks. As the rivers began to swell, nearly 200 residents heeded the warning of local officials to seek drier ground. The American Red Cross continues to operate shelters for affected residents and serve meals to first responders working in the area. On Wednesday, March 13, Gov. Pritzker directed the Illinois Emergency Management Agency to move the activation level of the State Emergency Operations Center to a Level 2 in order to expedite any state assistance or resource requests from local governments as they fight to protect their communities from rising floodwaters. “While the rivers have crested, it will be several days before the water begins to recede,” said Acting IEMA Director Alicia Tate-Nadeau. Emergency Management officials urge residents who have evacuated to wait for instructions from local officials before returning home. For more information on what to do before, during and after a flood, visit www.ready.illinois.gov. State assistance provided for statewide flood response to date includes: 234,000 sandbags, 125 rolls of plastic, 16 pumps in various sizes, and IDOC crews to fill sandbags.